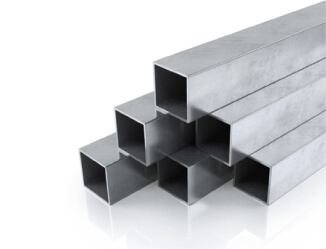 Stainless hollow sections are available in both square and rectangular sections. Stock bars are 7.5m and can be cut to specific lengths. Available in various sizes in both rectangular and square sections and a range of thicknesses. For prices and sizes available, give us a call or fill in a request a quote form. Stainless steel is a high strength, corrosion resistant material. This makes it perfect for outdoor projects due to the fact that it can resist the elements. It is extremely workable and therefore is a great application in the creation of square hollow sections. The high strength of stainless steel due to its alloy content allow this material to be a viable alternative to carbon steels. The aesthetic appeal of this material also allows these sections to be used in open building designs.